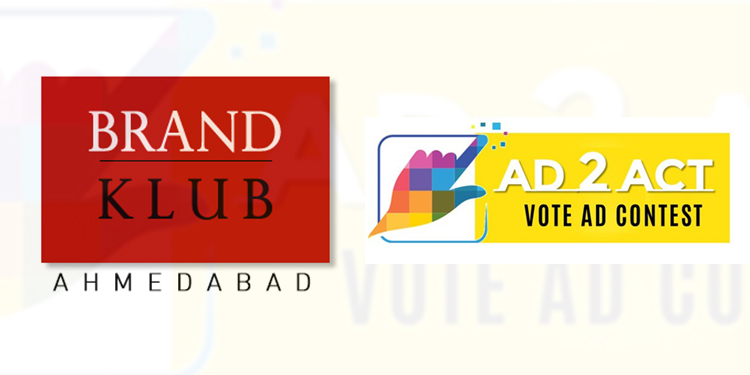 Brand Klub Ahmedabad, a club of and for like-minded individuals involved in the various facets of advertising and marketing communication in Ahmedabad has announced ‘AD 2 ACT’ Online Vote Ad Contest. Witnessing the flavour of the forthcoming season of Elections, this Ad Contest aims to stimulate citizens to participate in voting by generating awareness through these ads. This contest is free & open to all creative minds across the nation, who believe their disruptive thoughts can generate action. Anyone can participate by joining the Social Media Group (Facebook) of Brand Klub Ahmedabad. The short-listed best ads shall be judged by renowned panel of Jury. The last date of submission is April 30th 2019. The Best Three entries shall be awarded & certificate of participation shall be given to each participant. “The mission of the club is to create forums and events to help its members improve their professional competencies thereby raising the standards of advertising in the state. We have initiated such fruitful activities in past too. Gujarat has given to nation great brands and hence we feel it needs an organized platform that encourages advertising and marketing communication area to constantly update and enrich the fraternity in Gujarat towards the betterment of communication at large.”says Sanjay Chakraborty, Founding Member, Brand Klub Ahmedabad.